Running a business is tough. Running a public house is even tougher. Dealing with the public each and every day can be hell on earth. But doing all of these and doing it well takes special kind of people. It takes people who can see beyond the basic pounds shillings and pence. It takes people who believe that they can offer something different, that their business is a lot more than just an outlet serving drink or making sure that people come to the premises. John and Siobhan Hogan are these kind of people. Hogan’s, The village Inn was much much more than a business. It was a house, a home…… a home from home for many of us. It was our local, our place to escape, unwind, have a laugh, have a bit of craic, discuss the news of the day, the sport from last night , the games of tomorrow and our plans for the future. Oh and yes , to enjoy a pint or two. Hogan’s was not just a pub. . Any place could be a pub. But Hogans was special. Hogan’s not only served drink, it served the community. It served as a theatre, a church, an auction room, a museum, a lecture theatre, a changing room, a dance hall, a games room, a meeting room for countless organisations and groups. It was the scene of wild celebrations and countless parties. It was the venue for christenings and wakes. It fed flower groups, footballers and farmers. It was the home of race nights for Horses and mice. It was the venue for performers, players and late night poker. It was the pub for the sing song, the session and the set. Hogans was where everything was at. 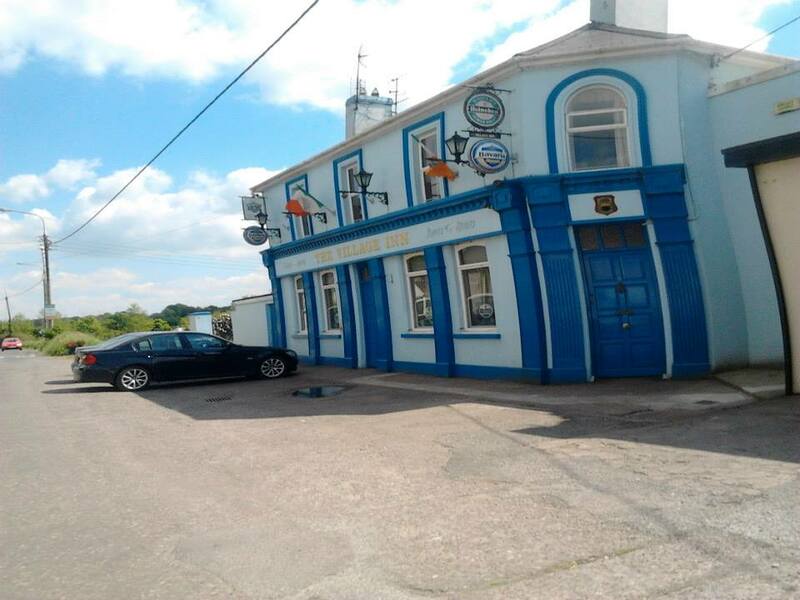 This pub, this building, this business was the focal point for so many things. There is no doubt that John and Siobhan ran a great pub but they also ran the village’s unofficial tourist office for many years. This pub was often the first place strangers would come to when arriving in the village. It is no coincidence that countless fishermen used here as their Irish head quarters and than many new people who set up home here in the area quickly considered Hogans as their local and John and Siobhan as friends. Hogans was also an unofficial FÁS training centre. There was many a young person received a crash course in the art of Bar work before heading out to the states or Australia so they would have something on the CV to carry them through a summer away from home. Hogans was the first place in Cork county to serve black and white pudding along with sausages and wedges in baskets. It was the first and probably still is the only pub to have a FIFA Soccer tournament every St. Stephen’s Day. It is the pub that holds a Poker tournament in honour of a dear customer who never drank alcohol. It is the pub that once held a gun club meeting, a dress rehearsal for a play, a community Council meeting and an Irish language gathering on the same night and at the same time and it if the whole lot bought more than 6 drinks between them it was as much. No wonder you’re closing!! When this pub was bought more than 15 years ago no one gave it a chance of surviving more than 15 months. It was in the wrong side of the village, it had a poor history, John and Siobhan knew nothing about the business and they were blow ins. But how wrong we all were. They quickly proved that it was on the right side of the village and that while they may not have known much about the bar business, they were both experts on people and knowing what they wanted and that’s what John and Siobhan did over the years. They gave us what we wanted and sometimes even what we didn’t want. To serve the community drink would have done. It’s what most pubs just do. But Hogans support the community. They have sponsored the GAA, Soccer and Camogie Clubs and many others that we know nothing about.. Spot prizes were doled out on a daily basis for various lost and worthy causes. If there was something to be done around the village then John Hogan would be asked to do it and he rarely refused. He was and still is involved in so many things, training teams, parents association, soccer club, GAA, Community council and even fishing. There were many nights when he should have been here but was stuck on some committee or at some pitch and Siobhan had to hold the fort. They are a unique partnership. They ran a unique pub, a unique business. And now it’s over. And it’s hard to believe that it’s gone, this haven for drinkers and friends, for people of all ages and backgrounds who would meet here and share friendship over a pint. This pub who had different customers at different times of the day. There was the early evening gang, the night gang and the late gang. But all knew Hogan’s as their local. All of us when we said we were going to the pub meant this pub. This pub which witnessed so much, this bar which saw old friends pass away and new customers come forth. Oh we’ll miss you. So on behalf of everyone, the organisations who called this place home, the card players, the musicians, the storytellers, the lovers of sport, the chancers, the characters, the customers who loved being here, but most of all, on behalf of all your friends we’d like to wish you the very best in whatever new challenge you take up and we want to say thank you. Thank you John and Siobhan for making a difference to our lives. This entry was posted in Useful Numbers and tagged Coachford, Hogans Bar, John Hogan. Bookmark the permalink. Thank you and good luck John and Siobhan for many’s the great night spent when I was back from Oz on holiday. I think a verse from the “Parting Glass” is appropriate. How can one get in touch with the Hogans. So sorry they have left the Village Inn. And as an angler, where can I get bait now. Thanks for your help. I come over to Ireland every year and base myself at Rye Court, fish at Coachford and drink at the Village Inn because I like John and Siobahn. Is that still a pub or is it closed altogether?